You can purchase your Pay n GO! Peach Pass at any participating CVS or Walgreens in Georgia. You do not need to provide any vehicle or contact information to get started. However, if you would like the added convenience of managing your account online, receiving vital message alerts or changing your toll mode, you can easily convert your Pay n GO! Peach Pass to a Personal Toll Peach Pass account. Simply call the Peach Pass Customer Service Center at 1-855-PCH-PASS (724-7277) or visit one of our retail centers (locations available on our Contact page) for personal assistance. As a bonus for converting your Pay n GO! Peach Pass to a regular Peach Pass account, $5 in toll credits will be added to your account! Purchase a prepaid toll amount between $20 and $500 plus an additional $2.50. Add more funds to your Pay n GO! Peach Pass Reload Card for $1.50 each transaction. At the retail register, load any amount from $20 to $500 to the card. The amount you load automatically credits to your new Pay n Go! Peach Pass account. In addition, a one-time $2.50 fee will be applied to the purchase of your starter kit. Place the Peach Pass on your vehicle windshield as illustrated in the mounting instructions. The Peach Pass transponder in the kit comes fully activated and is ready to use. 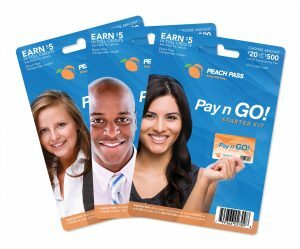 Customers who already have any type of Peach Pass account can buy toll credits on a Pay n GO! Peach Pass Reload Card in the amount of $20 to $500. A $1.50 convenience fee will be incurred each time you add funds. Present the Reload Card to the retail cashier and purchase your desired amount of tolling credits, between $20 and $500. Call 1-855-847-5071 and follow the prompts. Keep the card for future reloads unless using to pay for violations. Reload cards used to pay violations may not be used again. When prompted, enter your 8-digit Peach Pass transponder number and the 10-digit PIN listed on the card. Funds purchased will credit to your account. You only need to call the toll-free number once. Once your account is connected to the Reload Card, funds transfer to your account automatically. What if I already have a Peach Pass and want to start paying in cash? If you already have a Peach Pass account and want to change your payment method to cash, you can purchase a Reload Card with cash at any participating Walgreens or CVS. The Reload Card will need to be added to your account as the primary method of payment and you can load any amount between $20 and $500. A $1.50 convenience fee will be added each time funds are added. To add a Reload Card to your Peach Pass account, call 1-855-PCH-PASS (724-7277). Where can I check my Pay n GO! Peach Pass balance? You can check your Pay n GO! Peach Pass balance by calling 1-855-847-5071. Can I change to toll-free mode with my Pay n GO! Peach Pass? No, with a Pay n GO! Peach Pass account, you cannot change to toll-free mode. If you register your account and convert to a Peach Pass Personal Toll Account, you will be able to change to toll-free mode for a free ride on the I-85 Express lanes when you have 3 or more occupants in the vehicle. Can I link multiple Pay n GO! Peach Pass transponders to the same account? To link multiple Pay n GO! Peach Pass transponders to one account, you must convert your account to a Personal Toll Account. You can do so by calling the Peach Pass Customer Service Center at 1-855-PCH-PASS (724-7277).